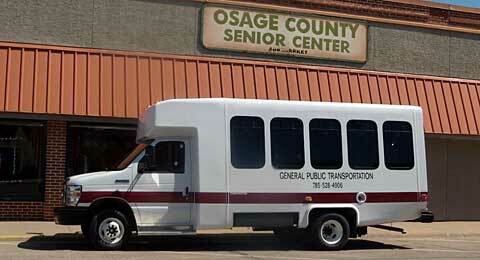 A new 2014 Ford E-450 bus has been added to the fleet of Osage County General Public Transportation. The public transportation service is retiring two older buses that are to be sold by sealed bid. The sign-up sheet is now out for the Aug. 28 rider appreciation bus trip to the Lecompton area. The bus leaves at 8 a.m. from the Osage County Senior Center for stops at Henry’s Plant Farm and a tour of the Territorial Capital Museum and Constitution Hall. The requested donation is $10 per rider to cover transit and entry fees. Everyone is on their own for lunch at Aunt Netter’s Café. The rider sheet for the Aug. 21evening trip to Emporia is full, but alternates are needed in case someone signed up can’t make it. We are looking at possible once a month Saturday mid-day trips in the future. So, let us know what you think and any suggestions you might have. We have been very fortunate to have Jesica Steele from the area agency on aging helping our patrons this summer with the armchair exercise program. Her guidance, patience, and energy were very much appreciated. This exercise program is conducted Mondays and Wednesdays at the senior center at 11 a.m. There’s plenty of room for more participants, and it’s free and fun. For more information about senior center activities or general public transportation trips, call the center at 785-528-4906 or stop by at 604 Market St., Osage City. Friday, Aug. 15 – Bingo 10 a.m.; cribbage 12:15 p.m.
Monday, Aug. 18 – Sewing 8 a.m.; armchair exercise 11 a.m.; cribbage 12:15 p.m.; play pitch and eat 5:15 p.m., with cards beginning at 5:45 p.m.
Tuesday, Aug. 19 – Senior commodities distribution 8-11:30 a.m. and 1-4 p.m.; ceramics 9 a.m.; Mexican Train games 1 p.m.
Wednesday, Aug. 20 – Sewing 8 a.m.; armchair exercise 10:30 a.m.; birthday dinner 12 noon, followed by PRN HHH blood pressure checks; cribbage 12:15 p.m.
Thursday, Aug. 21 –Art and painting class 9 a.m.; evening supper bus trip to Emporia 5:45 p.m.